Handmade stained glass kaleidoscope by Allison Borgschulte. 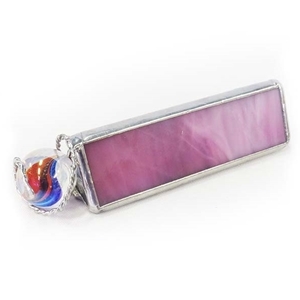 The outside casing is made with a wispy pink glass. It contains an equilateral 3 mirror system which results in repeating triangle images reflecting outward to the edges of the viewing area. Comes with a 1" marble which is interchangeable with other approx. 1" marbles from your collection. The marble is held in the scope with a coiled wire, which flexes to accommodate marbles ranging in diameter from about 7/8" to 1 1/8". The kaleidoscope is 4" long(not including wire and marble). The sides of the scope are 1 1/8" in height.